In the early 1960s, Denver’s Larimer Square was known for its homeless population and abandoned buildings. 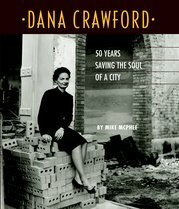 When Denver’s Urban Renewal Authority publicized its plans to raze the area in an effort to modernizing the city, preservationist Dana Crawford interceded and launched her own plan to preserve the historic buildings dating back to the 1860s. Crawford’s efforts helped to revitalize Larimer Square, leading to the thriving hub of commerce and community it is today. But her influence did not stop there, over 50 years later her legacy can be seen throughout Denver from modern lofts to the historic Union Station. Meet one of the country’s most influential preservationist. Aired November 10, 2016. Learn more in the official biography.